Like most young men, Erhardt and Fred Volkart were anxious to strike out on their own. In the early 1890s, the two boys were living with their parents Henry and Katherine (Wenig) Volkart, who were renting the Pollard farm (now the Dean Hamlin farm) in the “old town” area north of the village of LeRoy, Minnesota (1890 pop. 523). After saving money for the purchase of their own farm, Erhardt (nicknamed Hard) and Fred Volkart purchased a 160-acre farm in Beaver Township, located in Fillmore County on the border with Mower County. They were also able to buy another 160 acres just across the road to the west in Mower County. This second piece of land was without a building site and was covered with timber and pasture land, therefore not much of the land was arable. It was Fred’s dream that some day he would build a house and building site in the timber on this piece of land; however, that would never happen. The time was right for buying land. The United States economy was just emerging from the Panic of 1893. This recession was the worst in United States history up until that time, but by 1896, however, the rural areas of the nation were starting to come back to life. Indeed, the rural economy would come roaring back! Propelled by the growing influence of the young nation in the world economic markets and the resultant increase in exports of agricultural products to those markets, farm prices began to increase in 1896 and kept climbing in 1897. By 1897, commentators were stating that agriculture in the United States was entering a “new age” of prosperity. (Harold U. Faulkner, Politics, Reform and Expansion: 1890-1900, [Harper Brothers Publishers: New York, NY, 1959] p. 60.) It was the start of a period of relative prosperity which would be called the “golden age” of American agriculture and would extend all the way to 1921. Older brother, Erhardt (nicknamed “Hard”) Volkart stands on the top of the 40 x 62 inch Case thresher on the Volkart Bros. farm in 1948. Almost immediately the boys set about improving their farming operation. In 1896, Hard and Fred built a new barn on their farm. Later they added other buildings to the site. Sometime after 1904, when J.I. Case introduced its new line of all-steel threshers, the Volkart Brothers, together with Matt Klassy, purchased one of the new Case all-steel threshers. They also obtained a steam engine for powering the thresher. Matt Klassy and later his son Frank became the engineers of the threshing crew, responsible for the operation and care of the steam engine. Even after Matt Klassy sold the Bagan farm in 1908 and moved to another farm 2-1/2 miles to the west of the Volkart farm, the Klassys and the Volkarts continued to thresh together. The huge Model 35-70 Minneapolis tractor weighed 22,500 pounds (lbs.) and actually made the ground shake when it passed along the road at its travelling speed of 2.1 mph. Sometime after the turn of the century, Hard and Fred’s mother, Katherine, died and their father moved to the Volkart farm to stay with his sons. Later on, another brother, Henry Jr., moved to the farm with his new bride Frieda (Linde) Volkart where they were to raise seven children: George, born in 1912; Wilber (nicknamed Webb), born in 1914; Grace, born in 1916; Raymond (nicknamed Bud), born in 1918; Lorrie, born in 1922; Gerald, (nicknamed Gett and a long time Belt Pulley subscriber until his recent death), born in 1924; and Beverly, born in 1926. One day while on the farm, the owner of an 80-acre piece of wooded land to the east of the Volkart farm, and directly across the road north of the Bagan farm, approached Henry Jr., offering to sell his land. Henry Jr. offered him a “low ball” price of $10 per acre, expecting that the seller would walk away. To Henry’s surprise, the seller immediately accepted the price and the Volkarts found themselves farming yet more land in addition to doing the neighborhood threshing. On the extreme right side of this picture can be seen the un-styled John Deere Model G owned by Gaylord Aspel in the summerf of 1948. For many years the Volkart/Klassey threshing ring became the only ring in the neighborhood. However, in later years, another smaller threshing ring was started in the neighborhood by John Anderson. John, and later his son Mel Anderson, used a Case 28″ x 46″ thresher. Farmers of the neighborhood were either part of one ring or the other. One of the farmers in the Vokart ring was Gaylord Aspell. His son Jim Aspell of LeRoy, Minnesota, is nearly the only person left with first-hand memories of threshing on the Volkart crew. Members of the ring, who formed the crew during threshing season, looked forward to bringing the thresher to the Volkart home place because it was well known in the neighborhood that Henry Jr.’s wife Frieda was a good cook. A restored 1919 Model 25-50 Avery Tractor which looks like the Volkart’s 1914 Avery tractor. With the addition of the 80 acres purchased by Henry Jr., which needed to be cleared and plowed for the first time, the Volkart Brothers reasoned that the Avery could help out a great deal with the plowing of this virgin soil as well as some of the hard pasture soil on the “home place.” Accordingly, they purchased a 5-bottom Avery plow with the 25-50 tractor. 1914 Avery Company advertisement showing the Avery 25-50 tractor pulling a six bottom plow. Although the 25-50 was a good tractor while it was running, it proved to be a reluctant starter in any season. Webb Volkart, currently of LeRoy, Minnesota, was an adolescent while the family farmed with the Avery. He remembers that ether had to be poured into the cups on each of the four cylinders, and then the engine was turned by pulling a large lever attached to the flywheel. Once started, however, and placed on the belt for the threshing machine, the tractor worked like it was made for belt work–which indeed it was! About 1926, the Volkart Brothers and Matt Klassy heard about a Minneapolis 35-70 fuel powered tractor and a 40″ x 62″ thresher which were being offered for sale by a farmer in McIntyre, Iowa. The Minneapolis Threshing Machine Company (MTM) had introduced the 35-70 as the largest tractor in a new line of fuel-powered tractors in 1912. This huge four-cylinder tractor was one of the largest tractor ever built. The Model 35-70 was truly big! It weighed 22,500 lbs and delivered 70 horsepower to the belt. John Grass Jr., of LeRoy, Minnesota, remembers that when the 35-70 lumbered past at its travelling speed of 2.1 mph, you could feel the ground shake! The Minneapolis 35-70 tractor purchased by the Volkart Brothers and Frank Klassey, seen here in 1948 powering the 40 x 62 inch Case thresher on the Volkart Bros. farm. One of these Model 35-70 tractors is currently owned by Frank and Betty Sticha of New Prague, Minnesota, and can be seen powering the Melounek and Deutsch sawmill on the grounds of the LeSueur Pioneer Power Association. (It can be seen at the beginning of the Second Hour portion of Tape #1 of the International Harvester Promotional movies powering the sawmill and can also be seen at the very end of the same tape, as it was the final exhibit in the parade at the Pioneer Power 1992 Show.) Although most tractors seem to shrink in size from the childhood memories that one has of the same tractors, the Minneapolis 35-70 still seems every bit as big and awesome now as it does in the childhood memories of the author. The Volkarts and Matt Klassy purchased the huge tractor and drove it the 16 miles home to the Volkart farm–a trip that must have taken all day. They recognized that the Minneapolis was not a tractor designed for drawbar work in the field; therefore, no attempt was made to use the Minneapolis for plowing as had been done with the Avery. The Minneapolis was reserved for belt work each year on the huge Case 40″ x 62″ thresher which came with the tractor. An Aerial view of the Minneapolis Threshing Machine Company factory in Hopkins, Minnesota. Although Case did make a 44″ x 66″ thresher, only a handful of these machines were ever built. For all practical purposes, the 40″ Case machine was the largest thresher available to farmers. Generally, these large threshers were found in the western grain-belt states of the Dakotas and Montana. Smaller threshers were generally employed on the diversified farms of the row-crop areas like southeastern Minnesota. The Volkart Brothers were attracted to the thresher because of the double wing extensions on the feeder and the reputation that the thresher had of being impossible to overload. A double-wing style of feeder attached to a smaller (36 inch) Case thresher. At that time, stack threshing was common in the LeRoy area. After cutting and binding the wheat, the farmer would haul the bundles to a central location where the threshing would occur and construct a stack of bundles. Building the large stack was a technique that had to be learned. A proper stack would repel the rain and allow the grain to cure, or “sweat,” nearly as effectively as the grain might have done in the small shocks in the field. The stacks were built just far enough apart to allow the feeder of the thresher to be inserted between the piles so that bundles could be “pitched” into the feeder from both piles simultaneously. 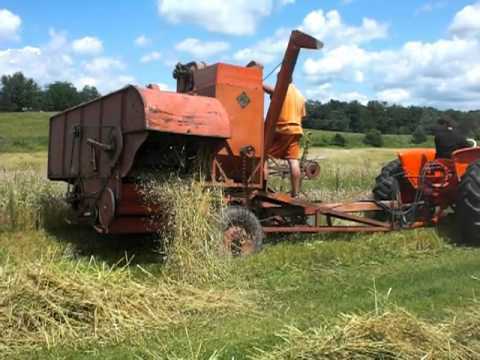 With sufficient wheat or oats, the farmer would build stacks in two rows so that the thresher could be moved ahead in a straight line to the next pair of large stacks once the first pair of stacks was gone. The bundled grain would then wait on the threshing day. The advantage of large stacks was that the fields would be cleared of the small grains so that the “under-crop” of hay which may have been planted with the small grain could be allowed to grow unhindered by the shocks as the farmer waited for the thresher to arrive on his farm. Because stack threshing was typical in the LeRoy area, the Volkart Brothers realized that the double wing attachment to the thresher would be especially useful. The double wing attachment consisted of two extensions which could be swung out at 90 degree angles on either side of the feeder. This was a great advantage for stack threshing. In order to repel rain, stacks were built with a slight downward slope on the outside of the stack. This meant that the sides of the stack could be slippery for the man or men standing on top of the stack pitching bundles into the feeder. The double wing attachment to the feeder on threshers basically extended the “feeder” out to the center point of the stack. The men on the stack could then stand in one place near the center of the stack and place the bundles gently on the wing, rather than “pitching” them into the feeder from the edge of the stack. The chain apron in the wing would glide the bundles along to the feeder where the bundles would be swallowed up by the thresher. In 1928, Matt Klassy and his son, Frank,purchased a large 25-45 Case tractor like this tractor which has been converted to a road building roller or packer. In 1928, the Volkarts and Matt Klassy sold the Avery tractor and the 5-bottom plow. With their share of the proceeds, Matt Klassy and his son Frank bought a Case cross-motor 25-45. The tractor was called “cross motor” because the engine was mounted on the tractor with its crank shaft parallel to the axles of the tractor. The cross motor style of tractors were discontinued by Case in 1929 in favor of the more conventional “in-line” engine tractor with the crank shaft of the engine perpendicular to the axles of the tractor which required the conventional-style differential for the rear end of the tractor. A pair of Case Model L tractors on rubber tires with rubber-tired Case plows at an antique tractor show. The Volkart’s Case Model L and Case plow operating in the fields would have presented a picture very similar to the beautiful color photo of Herb Wessel’s 1938 Model L and Case Centennial plow on the cover of the September/October 1994 issue of Belt Pulley. (Readers of Old Abe’s News will recognize another picture of the Herb Wessel Model L and Case plow on page 19 of the Winter 1993 issue of Old Abe’s News.) The Volkarts found that the Model L could walk right along with the three 16″ bottom plow even in the hardest of old pasture soils. There was good reason for this ability. The Model L delivered 30.02 horsepower to the drawbar. (C.H. Wendel, Nebraska Tractor Tests, p. 63.) Although the Model L also delivered 44.01 hp. at the belt (nearly as much as the old Avery), the Volkart Brothers never put the Model L on the belt with the 40″ Case thresher. That duty remained exclusively for the huge Minneapolis. On June 5, 1929, Matt and Doretta Klassy’s son, Frank, married Esther Lamon and started farming on another farm adjoining his father’s farm. Because of the ample storage space available on this new farm, the Minneapolis and the thresher came to be stored on the Frank Klassy farm. Every year, then, the thresher and Minneapolis would travel the 2-1/2 miles down the county and township roads to the Volkart farm after the threshing had been completed on the two Klassy farms. The route allowed the driver plenty of time to think, given the 35-70’s travelling speed of 2.1 mph. On these slow trips between farms during threshing season, a little boy (the author) on the Wayne Wells farm would hear the huge tractor and thresher coming down the road, and he would have plenty of time to run to the front yard to see them passing. These trips were so slow between the various farms of the threshing ring that Webb Volkart remembers one of the men on the crew would start off on the trip to the next farm while the rest of the crew ate dinner. Then when another member of the crew had finished his dinner, he would drive off in a car to relief the driver of the Minneapolis so that the tractor and thresher could proceed to the next farm without any interruptions. As the years went by, changes occurred in the Volkart family. Henry and Frieda’s oldest son George married Beatrice Hall and moved off the Volkart farm and onto his own farm south of LeRoy. Beatrice (Bee) Volkart still lives in the LeRoy community and has become a historian of the Volkart family, collecting many dates and much written material on the Volkarts and their ancestors. Their second son, Wilbur (Webb) married Ruby Whiteside on March 26, 1943, then he served in the Armed Forces in the Second World War. Upon his return from the military in November of 1945, he lived on the Volkart home farm for only about one year before he moved into the town of LeRoy to go to work at the John Deere dealership which was owned by the local Farmers Cooperative. His parents, Henry Jr. and Frieda, and the rest of their family, also moved to town. Once again, as it had been in the beginning some 50 years before, the farm was being operated solely by Earhardt and Fred Volkart. During that period of time, changes had also occurred in the method of harvesting small grains which would doom the large threshers, such as the Volkart thresher. Farmers began to seek tractors for cultivating their row crops. Farm equipment companies obliged by producing smaller general purpose tricycle-type tractors. For threshing, this meant that farmers began to seek smaller 22″ and 28″ threshers that could be powered by these smaller row-crop tractors. Although the threshing rings still existed, there was a trend toward more numerous and smaller rings with smaller threshers. With smaller rings, the grain on each farm could be threshed sooner after it had been cut; thus the shocks would not have to stay in the fields as long, and interference with the under-crop of hay would be held to a minimum.This meant the demise of stack threshing in favor of shocking the grain in the fields. The introduction of the Allis-Chalmers All-Crop Harvester in 1928 really spelt the beginning of the end of stationary style threshing grains. An advertisement of the new Allis-Chalmers Model 60 All-Crop Harvester small combine. By 1948, threshing with the Volkart’s 40″ Case thresher powered by the Minneapolis 35-70 was enough of an anachronism that it began to attract the interest of all of the neighbors as a sight that was slowly passing from the scene of North American agriculture. Busy as he was on the Bagan farm with harvesting in 1948 (See the article “Deering and McCormick Grain Binders” in the May/June 1995 issue of Belt Pulley, Vol. 8, No. 3, p. 16), Howard Hanks was sufficiently motivated to get his camera and take pictures of the thresher and Minneapolis tractor operating on the Volkart farm. In 1976, two of these pictures were published in the LeRoy Independent newspaper along with a story on threshing in the LeRoy area. These pictures reveal that horses were still being employed during threshing season on the Volkart farm as late as 1948. Furthermore, the article indicates eight bundle wagons, either pulled by horses or by tractors, were needed that day to keep a steady flow of bundles into the thresher. Webb Volkart remembers that in earlier years, when the thresher had been set up a substantial distance from the field, up to 16 bundle wagons were needed to keep operations going smoothly at the thresher. The Volkart brothers sold out their farming operation in the Fall of 1951 and moved into the town of LeRoy, Minnesota, where they lived the remainder of their days with their brother George and his wife Lil (Hansen). Following the Volkart sale, Frank Klassy and his wife Esther (Lamon) bought a McCormick-Deering 28″ x 46″ thresher in 1952 to do their own threshing, but after two years of farming, Frank put his farm in the Soil Bank government program for ten years and practiced his other profession as a carpenter. When his farm came out of the Soil Bank in 1964, he rented the farm to the families of John Grass Sr. and Frederick Bhend; however, he continued to live on the farm until his death in 1994. The story of the Volkart thresher conveniently coincides with the story of the changes that occurred in harvesting of small grains throughout the nation during the first half of the twentieth century, and is similar to that of a great number of farm families. The fact that part was captured on film helps preserve another chapter in the long history of American agriculture. It should serve as a lesson to us all about the necessity of saving old pictures and negatives. Even the most mundane of pictures will, in the future, be very important.